A graduate of BSc (Hons) Media & Society, a course which preceded today's BA (Hons) Arts & Media course, James' was enthused by the BSc's focus on addressing issues such as regeneration, the city and globalisation. "For years I was filming the hard architectural styles of post-war social housing. As I took this project to office blocks and skyscrapers, I began to move from hard-shots to classic landscapes." "It's not easy to get access to the rooftops—you can't just come up here. You need to have good connections and I've managed to build good relationships with people in the buildings." "There are so many possibilities in this massive and beautiful city that I just don't have enough time to finish. London will never be finished, so how can the project ever be finished?" 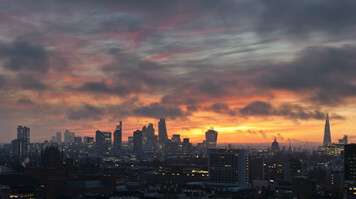 James' panoramic cityscapes and striking views were recently exhibited at the Print Space in Hackney. If you missed the showcase, you can listen to James speak about the exhibition and see some spectacular examples of his work by watching a video clip of James being interviewed on BBC London news. Find out more about BSc (Hons) Arts & Media using our course finder.